During the 1980s and 1990s, the Manchester and the Mountains area of Vermont was the epicenter of the fledgling sport of snowboarding. With the presence of Burton Snowboards, the U.S. Open Championships, and one of the earliest machine-built half-pipes at Stratton Mountain, the local population led the vanguard as the sport ventured from the fringe to the mainstream. Ranging from Olympic gold medalists to backhoe operators and converted skiers, locals contributed immensely to the development of the sport. The 2012 U.S. Open had a retro vibe to the week long event. In celebrating the 30th anniversary of the first snowboarding championships, the competitor bibs resembled the 1982 bibs, the official poster featured an iconic image of the 1987 Burton team, and Burton put on a retrospective exhibition. On Friday night, the Open featured the inaugural “Washed Up Cup,” which featured boarders who “went old school wearing hard boots and maneuvering around gates hitting a kicker at the end.”(1) While celebrating 30 years of snowboarding competition in Vermont, the event—unknowingly to the attendants— was the area’s swan song. Three months later, Burton announced that the event was moving from Stratton to Vail. The news left a cavalcade of emotional response. While the half-pipe became the focal point of snowboarding at Stratton at the U.S. Open, the relationship between the sport and the local community ran much deeper. The new book, Snowboarding in Southern Vermont: From Burton to the U.S. Open, chronicles the early years of snowboarding in the Stratton area. The book covers the early history of snowboarding, including life in the early Burton factories, the first employees, and the excitement of being part of a company at the vanguard of an emerging industry. There was a constant sense of improvisation throughout the early days—from Lyle Blaisdell’s masterful use of an excavator in shaping the first half-pipe to figuring out how to teach the hordes of new snowboarders arriving at the mountain. There are tales of the families that helped shape and develop the sport: the Hayes, Heingartners, Coghlans, Byrnes. There are the early Olympians: Betsy Shaw, Ron Chiodi, Ross Powers, and Tricia Byrnes and the coaches who helped them achieve their goals: Mark Heingartner, Suzi Rueck, Scott Palmer, and many more. A common theme throughout the story is that there was a cadre of snowboarders, bound by a common interest and a powerful sense of camaraderie, athleticism, and excitement. Everyone’s story is different, as they follow their own paths. While their journey brings them far and wide, they found themselves in southwestern Vermont, sharing a common bond. The Vermont Open returns to Stratton this year with the promise to capture the same spirit of early snowboarding that continues to live on in our corner of Vermont. Snowboarding in Southern Vermont: From Burton to the U.S. Open by Brian L. Knight is available at snowboardinginsouthernvermont.com and local retailers. 1. Devlin, Iseult. “Burton Celebrates 30 Years at Stratton.” Transworld Business Magazine. March 15, 2012. Web. March 22, 2015. 2. Boxler, Max. 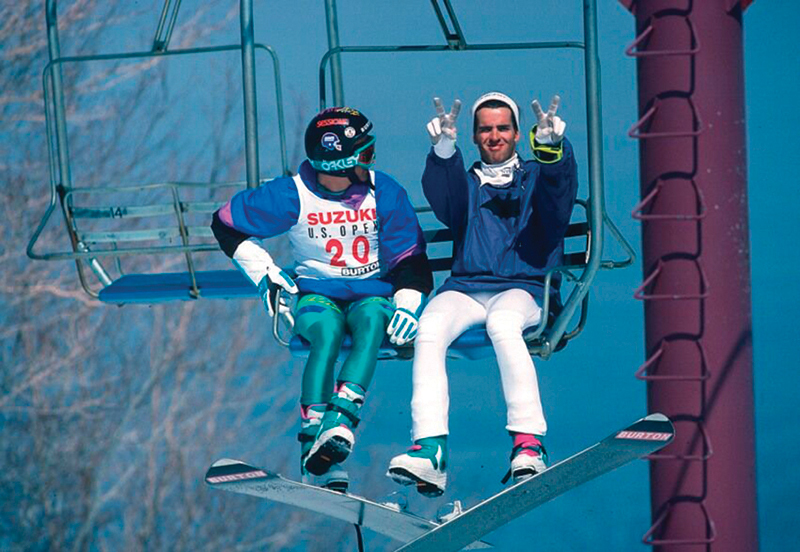 “A New Tradition: Hayes Brothers Ramp Up Vermont Open at Stratton.” New England Ski Journal. Spring 2013. Web. March 2015.